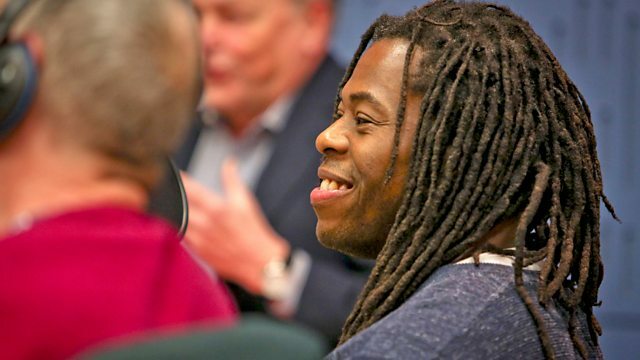 'Africa With Ade Adepitan' starts on 3rd February at 21.00 on BBC Two. ‘Kieran Hodgson: 75' is at London's Soho Theatre until 2nd February 2nd and then tours from 8th March to 28th May. 'good dog' is at the Watford Palace Theatre on 31st January and is touring until 23rd March. Company is at the Gielgud Theatre, London until 30th March. 'Cavalier' is available now on Reveal Records and ‘Eddi Reader Sings the Songs of Robert Burns’ is also available on Rough Trade Records. Eddi is playing at Kings Theatre, Glasgow on 30th January, Motherwell Civic Centre on 18th and Palace Theatre, Kilmarnock on 19th April. Check her website for further dates. ‘Sensitive’ EP is available now on TRIP. Ché is touring in March and April. He's playing at King Tut's, Glasgow on 20th, Gorilla, Manchester on 21st and The Joiners, Southampton on 23rd March.